Call Center Training Materials are for developing customer service and sales skills in the workplace. Train your call center employees how to effectively provide top-notch customer service. Teach employees verbal communication techniques, how to define the customer and the client, probing question techniques and more! Seeing is Believing This sample manual to teach Call Center Sales is in MS Word format. If you've ever considered call center sales training, you know just how varied the skills that need to be taught can be. From knowing how to ask questions, listen to customers-including the difficult ones!-and provide the right answers to their questions, to keeping distractions in the workplace to a minimum and being able to handle the stress that working in a call center can cause, call center training material requires a specific blend of sales and customer service training that can be hard to pull together. 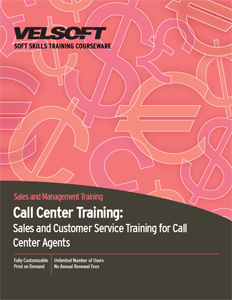 Luckily, Velsoft has designed this training material to cover every aspect of call center management training, including building relationships with customers, telephone communication skills, techniques for closing the sale, and more! Students learn how to communicate clearly and effectively, how to ask the right questions, and how to take messages and leave voice mail that won't trap them in the phone tag cycle. Velsoft's Call Center Sales Training Materials is completely customizable, and comes with three days' worth of training material broken into straightforward, dynamic session plans. Instructors can also combine their courseware with eLearning, enabling students to cover some of the material on their own through blended learning solutions, bringing the classroom and mobile technology together.